The Cosmos cement plant was built in Córdoba in the 1930s. Back then, this cement plant was far from the city, but as the city grew, residential neighborhoods were built around the cement plant (currently there are houses allegedly at 150 m distance). For many years there have been protests from the neighbors, demanding better filters to stop the ashes from the cement plant. In 2005, at the top of the building boom in Spain, the Cosmos cement plant in Cordoba (owned by Corporacion Noroeste) asked permission from the Andalusian regional government to 1) expand the capacity of its ovens and 2) to undertake what the company (and the European Commission) calls ‘waste-to-energy’ valorization or ‘energy recovery’ (which means to supplement the burning of their traditional fuel (usually coke petroleum) with waste). On 2nd of March 2007, environmental permission was granted by the Andalusian regional government to develop these two projects in the cement plant if some minor technical adjustments were made. As stated by the ABC newspaper the Andalusian regional government was allowing the cement plant to burn 14.000 tones/year of plastics; 26.000 tones/year of tyres; 54.000 tones/year of sewage sludges and 43.000 tones/year of domestic waste. In response to the government permission, a strong and very diverse mobilization and local organization emerged against the co-incinerator project. They have undertaken several actions and put lots of pressure on the company. Partially due to these local mobilizations and also the opposition of the then Cordoba mayor (Rosa Aguilar), the cement company decided not to burn any waste for the moment. El Día de Córdoba newspaper reported: “La cementera Cosmos mantendrá “en su totalidad” los combustibles tradicionales, a través del coque de petróleo, en lugar de la temida incineración de lodos de aguas residuales, neumáticos y plásticos para liberar energía en la producción de cemento”. However, a more important reason was the economic crisis, and excess capacity of cement production in Spain. The factory stopped production periodically. It asked for an extension to adapt its technology to waste burning. In November 2011, media reported that the cement plant had decided to continue to develop the co-incinerator project. In 2012, pressure built up. The conservative ABC newspaper reported on 18 Oct. 2012 words from Jesús Padilla, speaking for the collective Cordoba, Clean Air or in Spanish, “Córdoba, Aire Limpio”, "que bajo el paraguas de la federación de asociaciones de vecinos Al-Zahara envió el lunes al equipo de gobierno local, y a través del registro de entrada del Ayuntamiento, un documento de veintintrés páginas en el que advierte de los riesgos de que la factoría de cemento de Cosmos-Cimpor comience a incinerar neumáticos y plásticos. «Nosotros consideramos que el derecho a la salud es un derecho fundamental y primario, que el bien común está por encima del particular, al tiempo que queremos dejar claro que no apoyaremos ninguna decisión que hipoteque el futuro de Córdoba y de los cordobeses”. The company itself denied the allegations then and now. As of October 2013, if the cement plant aims to engage in co-incineration, then it seems that the bureaucratic process should start again, and the anti-incinerator platform remains under alert. It seems that the factory (owned by now by the Brazilian conglomerate Votorantim) has no plans to expand cement production. In March 2015, the platform Aire Limpio warned that the Junta de Andalucía opened again the possibility for the company to start the incineration facility; reactions by political candidates have been reported. Some also expressed deep concerns about health impacts co-incineration will have on the population . 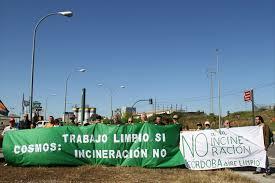 Development of Alternatives Not to grant the permission for the cement plant to co-incinerate wastes for fuel. Why? Explain briefly. The company was not able to switch to co-incineration to fuel the plants in 2007 and the anti-incinerator groups claim that they helped stop the certification. The company asserts on the contrary that it was its own decision to stop plans for "energy valorization of waste" due to slack in cement demand after the economic crisis of 2008. Newspaper article: (03/10/2013). La Junta anulará la licencia de Cosmos para quemar residuos. En: ABC. Nespaper article. 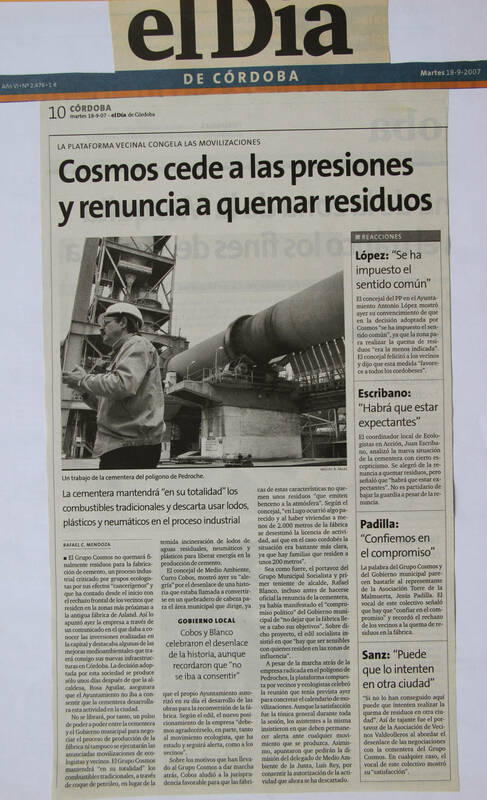 (18/09/2007) Cosmos cede a las presiones y renuncia quemar residuos. En: El Día de Córdoba.